Our June meeting, our first formal meeting since March, was a little different. In fact, it was probably ‘a first’ when it comes to LCC borough group meetings because, unusually, it did not take place in the home borough but in one of our neighbours. On Monday, 15 June, we travelled to Merton to welcome our guest, Amy Summers, LCC Activism Co-ordinator. Charles Barraball had kindly arranged for us to use the same venue that Merton Cyclists use for their monthly meetings, in All Saints Road, Wimbledon. We would like to extend our thanks to Charles, and the staff of the All Saints Centre, for being such great hosts. It was also a pleasure to have Mike from Croydon Cyclists join us too, taking the number of attendees to ten. We had invited Amy to join us this month primarily because we wanted to discuss options for our Space for Cycling petition handover. It was also, of course, an opportunity for people to meet Amy, and to hear more about new guidance that LCC had recently introduced to help clarify the process that local groups needed to follow when organising events. Following brief introductions, and welcomes, we took a look at the actions from our March 2015 meeting. Action 1: To write to Mary Morrissey, Strategic Director of Environment and Neighbourhoods, to advise that we would like to meet the consultants and have some involvement with the preparation of the draft strategy. Although this action was had not been followed through, Mary Morrissey was copied-in to an email sent to Eleanor Purser, see Action 2 below. Action 2: To write to Eleanor Purser, Executive Head of Economic Development Planning and Sustainability, to ask for an update on progress. An email was sent on 29.03.2015, and a reply received the following day, see Review of our ‘ward asks’ in Notes from our March 2015 meeting for details. Thank you for your e-mail sent on 29th March requesting an update on the current status of the ‘Ward Asks’ review and the cycling strategy. I apologise for not responding to your e-mails and keeping you up to date on the latest progress. As you know, an initial review of the ‘ward asks’ was undertaken by officers in December. However at that time, as resources were not available to investigate the proposals in detail, and after discussions with you and Councillor Jill Whitehead about the need for a cycling strategy, it was decided that the available resources should be focused on progressing a cycling strategy. A consultant, Steer Davies Gleave, has been commissioned to help officers develop a borough Cycling Delivery Strategy. The draft strategy has been written and will be presented to a Task and Finish group, made up of officers and Councillors, on 8 July, to agree its contents for public consultation. Therefore it is anticipated that you will be consulted, along with all the interested stakeholders, in July 2015. We are still finalising the details of the extent of the consultation and timescales, but it will include individual consultation by e-mail and holding a workshop type event on 23rd July. The Get Sutton Cycling ‘Ward Asks’ has been taken into account in the Cycling Delivery Strategy. One of our continuing objectives will be to work with cycling groups to develop future schemes to get people cycling in the borough. Please be assured that the draft strategy is being prepared as a starting point for discussion and can be changed as a result of the comments received during the consultation period. Officers are now investigating your ‘ward asks’ proposals in more detail as some of the schemes may be included in the action plan as part of the strategy. Again, please be assured that you will be consulted on the proposals. You will be receiving a ‘save the date’ invitation to the workshop and consultation documents shortly. The response was subsequently published online as Transforming Fiveways Croydon on 26 March. To facilitate this, activities had included a stall in Wallington on 9 May (thanks to Charlotte Gilhooly and Stephen Hart for organising and helping with this), and on-street engagement in Wallington and Sutton on 19 June (thanks to Chris Rutland). The petition officially closed on 21 June, and there was some extensive promotion through Twitter on the days preceding this. On 19 June, for example, we asked wouldn’t it be ace if cycling to the park felt as safe as driving to the park? Later the same day, we considered whether cycling would ever be an attractive option on the A232. We took another look at Woodcote Road in Wallington the following day (and found the same issues that had been reported six months ago), and suggested that we need to do better than this to Get Sutton Cycling. Finally, on 21 June, we compared Park Lane today with how it looked eight years ago, and claimed we can do better than this. The gallery below has the media attachments. Update : Largely as a result of these two events, and the online promotion, over 400 people have now added their name to Sutton’s petition. This is believed to be the highest level of signatories amongst the 19 outer London boroughs for LCC’s Space for Cycling petition, and possibly the seventh highest level of all 32 London boroughs. Quite an achievement. There is, of course, a stark contrast between this and the level of support from Sutton’s councillors. At just 19%, this puts Sutton at the lowest of any London borough with the exception of Hillingdon (17%) and Bexley (6%), and well below the level of support across London as a whole (47%). Email sent 22.03.2015, reply received 26.03.2015. For the background to this, the resultant conversations, and updates, see the Quietways section in the notes from the March meeting. Partially completed, with Heart of Hackbridge and space for cycling published on 31 March. The sister post, for Green Wrythe Lane, is still to be completed. Letter sent 20.03.2015, and an edited version published 02.04.2015. See Letter to Sutton Guardian in Notes from March 2015 meeting. It was noted that our second newsletter (Sutton borough news and update, June 2015) had recently been published online, and distributed with the June edition of London Cyclist. This is available to download from our Newsletters page. Amy reported that the petition was close to reaching 10,000 signatories across London, and all borough groups were currently being asked to make the necessary preparations to hand their petition to their Council Leader (in our case Councillor Ruth Dombey). Groups could either do this themselves, or ask LCC to do this on their behalf. Either way, this needs to be completed by the end of July. 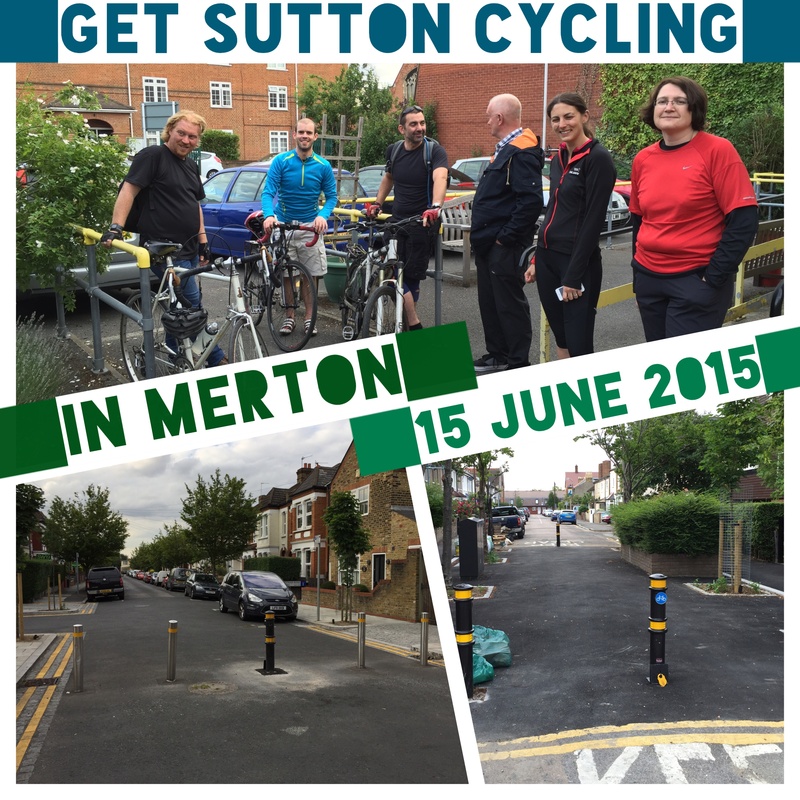 We decided that Get Sutton Cycling would like to do this, especially as we had had such a good response to the petition. It would be necessary for us need to produce a cover letter, and a press release. Templates had been prepared. LCC were about to contact all supportive candidates to ask them to fill in a short feedback survey via a personalised link. Their comments and progress status will be displayed on the mapping website. Across all 18 wards in Sutton, the status currently remains at “No significant progress made to achieve this cycle improvement”. It was anticipated that LCC would be sending out the first petitions to some councils by the end of June. These would include copies of the booklet Creating Space for Cycling: a guide for Councillors (PDF document | 12.2 MB), with background to this on the LCC website at Space for Cycling: a guide for councillors. Action: to write to the Council Leader Ruth Dombey to request a brief meeting to handover the petition and include a photo call. To prepare a cover letter for petition. Update: wrote to Ruth Dombey’s PA Duncan Borrowman on 20.06.2015. The result of which was a suggestion that an ideal opportunity for the handover would be at the proposed cycle summit (or workshop event) to be held on the evening of 23 July, and Ruth would be happy to take part in a photocall. A cover letter for petition prepared on 23.07.2015, and a press release on 21.07.2015. The cover letter and press release can be downloaded from Space for Cycling petition presented to the Leader of the Council subsequently published on 30.07.2015. New LCC policy for rides and events came into place on 1 June, and applies to all Local Groups. New guidance is being issued for Local Groups to help clarify the process for organising events, including rides as part of a Local Group. This is necessary because only official LCC events are covered by LCCs public liability insurance, and to be ‘official’ the events need to be registered on LCC’s website. Coordinators have their Local Group login to use to post official rides and events on the LCC website, and the login can be shared between members. Any existing local group events will have defaulted to ‘unofficial’, but Amy can updated these to ‘official’ if you let her know. For more information, see LCC’s Rides and Updates (PDF document | 142 kB). A Governance Review, to include a discussion paper on the constitutional status of LCC groups, proposed changes to the LCC Articles (Groups) and a proposed model constitution for LCC groups, is ongoing. A general discussion followed, and this included questions and comments for Amy (engaging with more people, group promotion and learning from other groups (e.g. tagging bicycles), collaborative, cross-borough working (by councils as well as campaigners); the benefits of cycling for business (review research evidence); London Cycling Awards 2015; forthcoming CLoS training; Sutton Council’s Cycle Forum, and what we can learn from council forums in other boroughs; a quick review of what was happening in our neighbouring boroughs Merton: Wimbledon Quietway; Croydon: 20 mph and Quietways (Norbury Avenue) (with some potential benefits of reduced through traffic on residential streets subsequently published by Inside Croydon); Kingston min-Holland (with good news on this a few days later in Set your pedals for Portsmouth Road mini-Holland scheme from Kingston Cyclists). With the anticipation of a draft Cycling Delivery Strategy imminent for Sutton, and some recent draft borough strategies having been published in other London boroughs (including Bromley and Brent – although unlike Southwark and Hammersmith and Fulham, these are not perhaps very good examples), we threw some ideas thrown around as to what makes a good cycling strategy. Finally, it was agreed that Amy would share the business card template that other groups have used, plus the details of the Croydon ‘wristband’, and details of an online forum type tool that Newham are using. Some group members expressed an interest in receiving the Friday Post weekly update, and it was agreed that Chas would forward on e-mail details to Amy. Our hour at the All Saints Centre ended all too quickly. Some of us then adjourned to The Sultan, where discussions continued informally around the recent Hackney Cycling Conference, and making use of Streetmix to design and share our streets!